During 1941 and 1942 only limited raids were mounted against England. Bf 109s carried out low-level cross-Channel raids on coastal targets, and small numbers of bombers were sometimes despatched to attack important specific targets. In October 1942 Fw 190 fighter-bombers, followed by a large force of night bombers, attacked Canterbury. Further minor raids were flown by the pilots of SKG 10 (SKG standing for Schnellkampfgeschwader, literally Fast Bomber Wing, or Fighter-Bomber Wing), which was equipped with the Fw 190A. Early in 1943 a new staff position, the Angriffsführer England (England Attack Command), was established by the OKL, which concentrated the fighter-bombers of SKG 10 and the Me 410s and Do 217s of KG 2 under the command of Oberst Dietrich Peltz. Because a steady increase in the number of British nightfighters progressively reduced the chances of Luftwaffe bombers returning safely to base, the German High Command developed a new tactic. This involved despatching Fw 190A long-range fighter bombers, known as ‘Jabo-Reis’, against targets in Southern England, each carrying one SC 250 or SC 500 bomb and two 300-litre drop tanks. SKG (Schnellkampfgeschwader) 10, which operated these aircraft, was based at St André and Caen from early 1943. 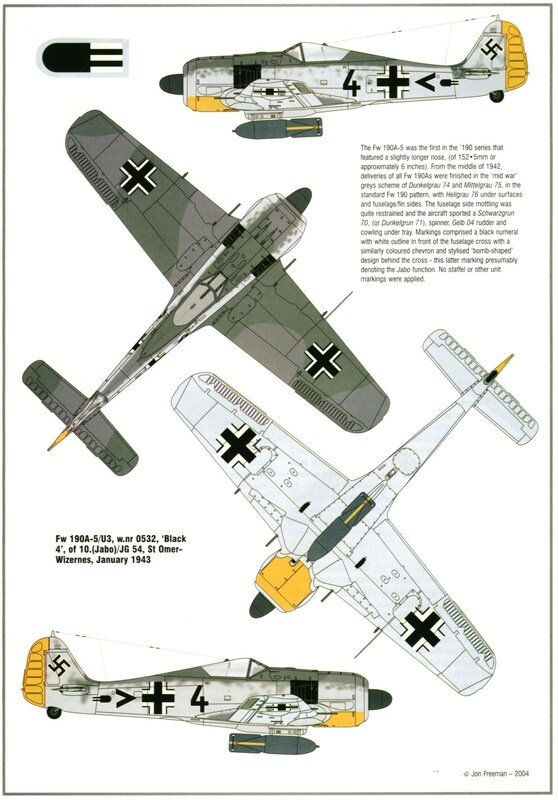 The Fw 190G-3 ‘Jabo-Rei’ had a range of 1,000 to 1,100 km. Only a small number of these fighter bombers ever became available, these becoming part of SKG 10 at an early stage. Of the unit’s twenty-two G-3s only sixteen were serviceable and ready for action on 25 December 1943. In autumn 1943 SKG 10’s II and III Gruppen became II and III/SG 4 (SG standing for Schlachtgeschwader or Combat Wing) and were subsequently part of SG 10, which was engaged in the defence of the Normandy coast during the Allied invasion of June 1944. Due to the overwhelming strength of the Allies’ forces here there was little chance of achieving more than local successes. 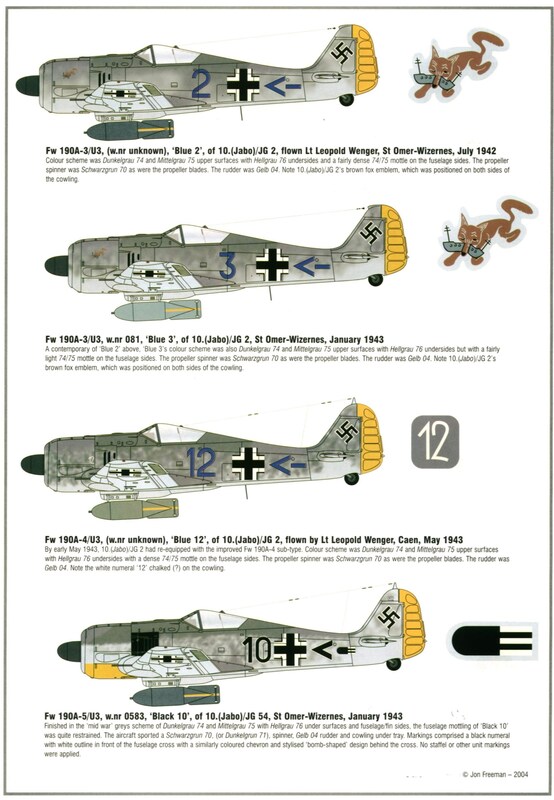 Two months before Dieppe, while all the fighter units of JG 2 and JG 26 had converted to the Fw 190, their respective fighter-bomb Staffeln, 10. (Jabo)/JG 2 and 10. (Jabo)/JG 26 still had their original Messerschmitt Bf 109F-4s. 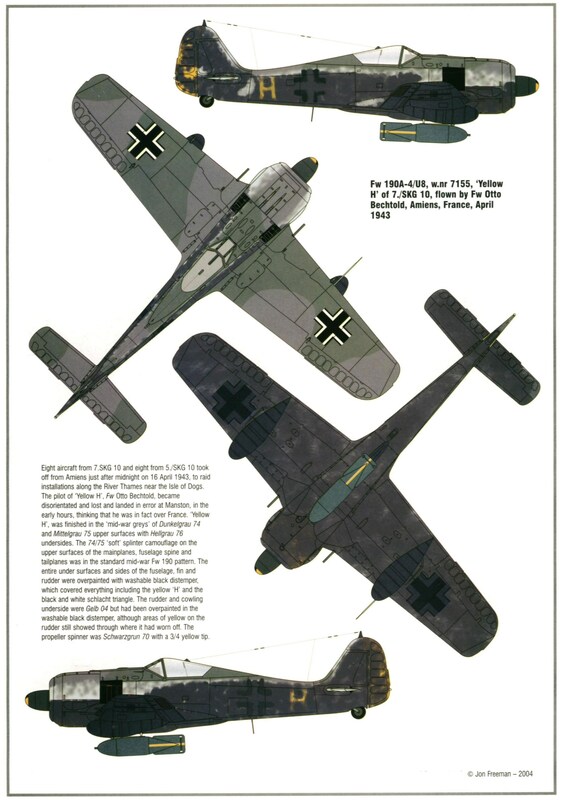 In late June, however, both began to work up on Fw 190A-2s and A-3s fitted with centreline racks to carry bombs. Operations began swiftly, with bombing raids on shipping around the Isle of Wight in early July. Throughout the remainder of the month and into August, the two Jabo units carried out nuisance hit and run raids on targets both at sea and inland. In addition to shipping, the Jabos targeted factories along the south coast. By the time British fighters had been scrambled to intercept them they were already on their way back to France. Fighter escorts were sometimes provided for the bomb-armed Fw 190s but on most occasions they proved unnecessary. During four months of raids, JG 2’s Jabos suffered no losses. JG 26 lost just one pilot – an inexperienced flyer who, having attacked the airfield at Manston, went back for another go and was shot down in flames. He survived and was taken prisoner. The broad sweep of German attacks was narrowed down to targets in Kent and Sussex in October 1942 – those closest to the unit’s bases in France. The British attempted to counter the Jabo threat by positioning five squadrons of the fast and heavily armed new Hawker Typhoon on the south coast and lying in wait for the Fw 190s. This yielded some success and a pair of Typhoons from 486 Squadron successfully bounced two Jabos from 10./JG 26 shortly after they had attacked a church in Hastings, killing two civilians and injuring 16 others. One of the Fw 190s crashed into the sea and its pilot, Feldwebel Karl Niesel was killed. In his official report, the surviving pilot described that attack’s target as “a block of flats”. Meanwhile, Hitler ordered that more daylight raids should be carried out on Britain in retaliation for the RAF’s night- bombing offensive. Therefore, the Luftwaffe planned an all-out Vergeltungsangriff or `vengeance attack’ on a British city and picked Canterbury as their objective. Unfortunately, the Jabo units of JG 2 and JG 26 were the only bombers in France at the time and between them they could only muster 19 serviceable aircraft. 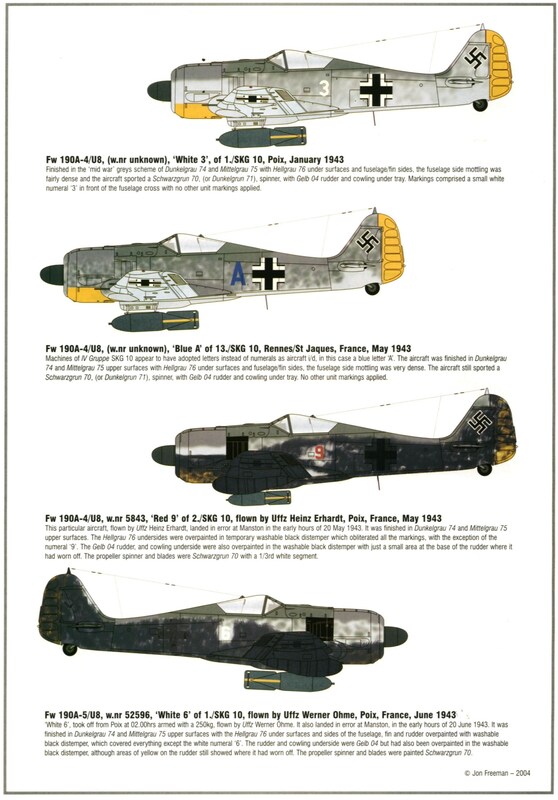 As a result, they were joined by yet more Fw 190 fighter-bombers from III./ZG 2 and several dozen fighters from the other Staffeln of JG 2 and JG 26 were fitted with bomb racks, resulting in an attack force of 68 bomb- carrying fighters. They were to be escorted to the target by 62 more Fw 190s while six carried out a diversionary raid elsewhere. After waiting for just the right weather conditions, this large force set off late on the afternoon of October 31 and arrived over Canterbury at around 5pm, flying fast and low. As soon as they were reported approaching the coast, barrage balloons were raised and a number of the German pilots dropped their bombs off target as a result. Nevertheless, 31 bombs hit the city and killed 32 people, as well as causing a significant amount of damage to buildings. Spitfires were scrambled but as before the Fw 190s quickly turned around and sped back to France once their munitions were expended. Only a single Fw 190 from II./JG 2 was caught and shot down, its pilot being taken prisoner. However, during the return flight Leutnant Paul Galland, brother of General der Jagdflieger Adolf Galland, and his wingman became lost in low cloud nine miles from Calais. He then heard a distress call from another German pilot and after some searching spotted a Fw 190 flying very low and being chased by a Spitfire. He went to help but the Spitfire pilot saw him coming and pulled away into the clouds. Galland entered a turn and his Fw 190A-4 stalled. He was trying to recover when the Spitfire emerged from the clouds and fired on him. Bullets hammered into Galland’s machine and it went down in flames. His wingman then shot down the Spitfire, believed to have been from 91 Squadron. Although the successes of the Jabo raids had been relatively insignificant, the Germans resolved to intensify them as 1942 drew to a close. It was decided that a new sort of unit should be established to specialise in these attacks – the Schnellkampfgeschwader or `fast bomber wing’. SKG 10 was to have three Gruppen, each comprising four Staffeln, compared to the more usual three. Since existing Fw 190 pilots were all needed elsewhere, SKG 10 would be manned by former Bf 110 pilots drawn from the Zerstörer Gruppen or `heavy fighter groups’. The Jabos continued to attack the south of England and during one raid on London on January 20, a 500kg bomb dropped by a Fw 190 landed on Sandhurst School, killing 38 children and six teachers. Elsewhere, the raid resulted in the deaths of 26 more civilians with dozens injured. By now, SKG 10’s first two Gruppen had completed their training and their campaign of fighter-bomber raids on the south of England began on March 8, 1943, with the bombing of a trawler close to Eddystone Lighthouse. Hastings was hit again on March 11, followed by a raid on Ilford and Barking on March 12. These nuisance or `vengeance’ attacks continued throughout the month and into April. This entry was posted in Air Warfare, German Units by MSW. Bookmark the permalink.